SACRAMENTO, California, June 15, 2011 (ENS) – Rebates for Californians purchasing new zero-emission vehicles through the Clean Vehicle Rebate Project may run out by July due to high consumer demand, says the California Air Resources Board. The rebate program may be approved for additional funds at the Air Resources Board’s July board hearing and upon passage of the state budget, with funds for rebates becoming available sometime in the fall. A total of $11.1 million was appropriated for fiscal years 2009-2011 to promote the production and use of zero-emission vehicles, including electric, plug-in hybrid electric, and fuel cell vehicles. Rebates of up to $5,000 per light-duty vehicle are available for individuals and business owners who purchase or lease new eligible zero-emission or plug-in hybrid electric vehicles. But less than $928,929 is still in the fund, about nine percent, and if the money runs out before new funding is available, applicants will have to be placed on a waiting list. In response to overwhelming consumer demand and to increase the number of rebates available, the Air Resources Board is proposing to triple the funding allocation for the rebate program next fiscal year to between $12 million and $17 million, and reduce the rebate amount by half – from $5,000 to $2,500 – in order to meet increasing demand. The additional funding is projected to allow for about 6,000 rebates – four times the number funded this year. Yet even with the anticipated increased number of rebates available, this funding is limited and may not be enough to meet consumer demand next year, so consumers are encouraged to apply early. Launched in March 2010, vehicle rebates are offered on a first-come, first-served basis for passenger cars, zero-emission motorcycles, or ZEMs, and neighborhood electric vehicles, or NEVs. Currently, rebates range from $1,500 to $5,000, depending on vehicle type. In May, the $9.1 million rebate project was increased by $2 million by the California Energy Commission to fund an additional 400 vehicles. About 1,400 rebates have been issued to date. The funding provided by the Commission will only be open to light-duty zero emission vehicles capable of freeway operation and certified for four or more passengers. Other vehicles – such as two-door zero-emission vehicles as well as the ZEMs and the NEVs – are still eligible for rebates through the Clean Vehicle Rebate Project, but will not receive rebate checks until funds for FY 2011-2012 are added. This will likely occur sometime in September or October. 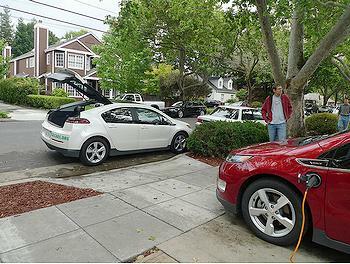 The vehicle rebate project is one of several consumer incentives funded under the California Alternative and Renewable Fuel, Vehicle Technology, Clean Air, and Carbon Reduction Act of 2007. This law allows funding of up to $40 million per year through 2015 for the Air Resources Board to fund advanced technologies needed to meet longer-term air quality and climate change goals. Nichols says the state’s early investment in zero-emission and plug-in hybrid technologies will prime the market for the larger number of these vehicles needed over the next decade and beyond.